CryptoForge - Data encryption software for email, folder and file encryption. Data encryption software by CryptoForge allows you to secure your sensitive data everywhere it goes with strong AES encryption. It features a file encryption module which allows you to encrypt files and folders of any type and size, on any kind of media, including external USB drives, mobile devices, flash memories, and network folders. It also includes a file shredder for secure data disposal. Email encryption is also very simple since recipients of encrypted files don't have to install software to be able to decrypt the files. The Text encryption module converts anything into ciphertext. You can send encrypted text via any messenger program, or even post the ciphertext to social networks. This encryption app also features multiple encryption, file name encryption, data compression, cipher speed meter, four encryption algorithms, and a complete command line interface for easy integration into existing systems. What's New: You can now send encrypted files to anyone, or decrypt files on any computer with the new Decrypter app, which is a portable, free, and tiny app that allows the decryption of files on any computer without CryptoForge installed. It also supports Windows 10 and includes bug fixes. This download (CryptoForge.exe) was tested thoroughly and was found 100% clean. Click "Report Spyware" link on the top if you found this software contains any form of malware, including but not limited to: spyware, viruses, trojans and backdoors. 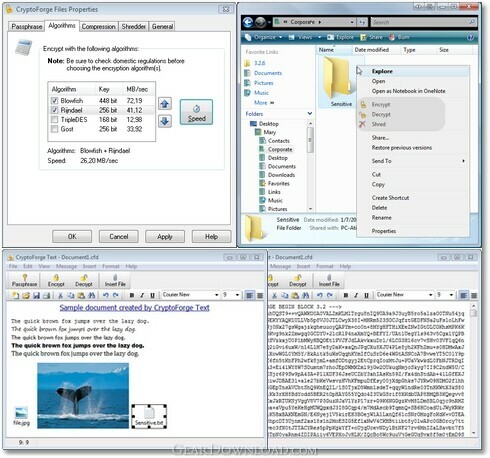 CryptoForge Decrypter 5.1.0 - Portable, freeware app to decrypt CryptoForge encrypted files.